Adagio Acres » Rolled, Steel Cut or Quick Cooking? Rolled, Steel Cut or Quick Cooking? What’s the difference anyways? Adagio Acres is excited to now be offering three different ‘styles’ of oats. Our traditional large-flake rolled oats are great for porridge, baking, and granolas, and offer a texture that is versatile for a huge variety of recipes. These rolled oats are produced by flattening the oat groat between two large rollers, which exposes the inside of the oat groat and allows them to cook and soften quickly. 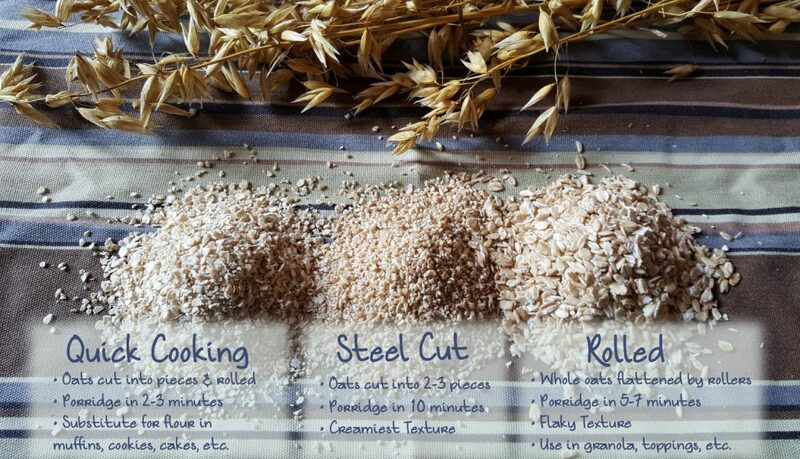 Steel Cut Oats have the same nutritional value and benefits, but are produced by cutting the oat groat into two or three pieces with steel blades rather then flattening them with rollers. The result is an oat with a unique texture that makes a wonderful slow cooking porridge, smooth and creamy while still retaining some of the original ‘crunch’ of a minimally processed oat. They can also be roasted, cooked briefly, and used as a substitute for couscous, quinoa, or rice in salads and stews. This adaptability makes them a great platform for experimentation, and we love finding new ways to sneak oats into all three meals of the day! Our Quick Cooking Oats are milled by first chopping our oats into small pieces (steel cut) and then rolling them as thin as possible to expose more surface area, which allows them to cook quicker and bind together easier when baking. Unlike ‘instant’ or conventionally milled quick oats, these oats are not steam processed, and the nutritional value is not altered in any way. We like to use Quick Cooking Oats in muffins, breads, cookies, pancakes and squares, or to replace up to 1/3 of the wheat flour in any recipe that needs a flavour and nutrition boost!